Well, I’m working on my first human. (Scary, I’m telling you.) She’s turning out pretty well, and I think I just have the feet to work on now, but… Well… The hands came out pretty darn awesome, if I do say so myself. This is my first hand ever, so don’t pick on me too badly! But I AM looking for areas to “plus it”. By the way, these are supposed to be about 11-12 year old (girl) hands. P.S. I won’t release my whole model for visibility until I have permission from the subject. When/if that happens, y’all can pick on the parts based on the photos I got. The Nails shader was a quick throw in. I was curious what y’all would say to it. Too blue = more pink on it’s way. A fingerprint bump map would be awesome… I’ll have to think about that. By the way, this is the result of following this tutorial. I made it most the way through, and got lost on the palm work, so I started hitting things on my own. 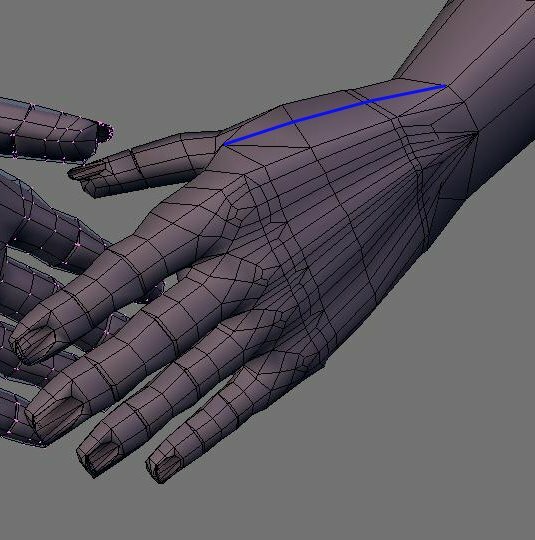 Hence, the thumb and palm aren’t exactly how the tutorial calls for them to be done. Those are the weakest parts, I believe. Me=Geek. So… My complexion = Basement geek. Ok, I’ll soften and lighten. Thanks! Well, tweaked the SSS and nails. Nails went WAY the wrong way, but I think the skin looks better. you just want a free hand for your zelda game! if you can equip me with a concept( PM it) of the type of a hand you want i can give it a try and model you a lowpoly one. I think I just realized… I have an appointment… In Turkey… BYE! Ok, ok… Well, let me warn you. The tutorial kept to pure quads, and when I got lost, well… I was on my own. I’m still new to quad modeling, so I slipped in a few triangles. dont worry the tris are fixable, and in time youll just be able to fix em on your own, if you back that file up/dont delete it you can allways come back to it! Nice! That’ll allow me to pull it out a bit, too! Thanks! 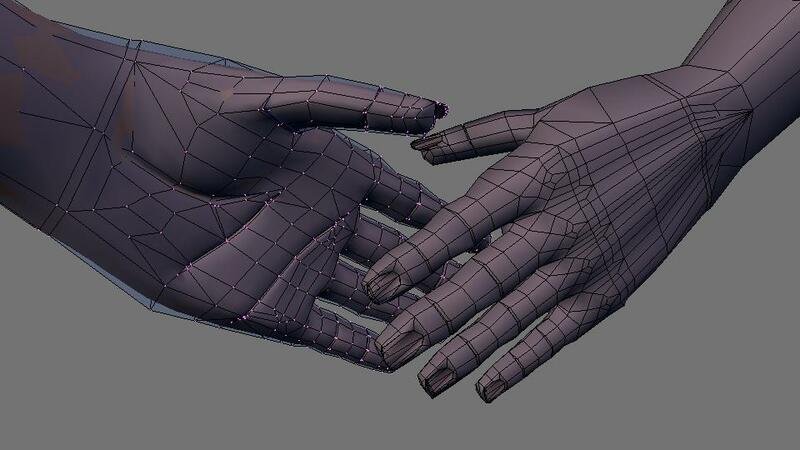 Now show me how to remove the tris around the underside of the thumb. Hmmmm I like it. however, the edges and tips seem to be a bit square to me… pull them out a bit maybe?